Map the columns of the source, or combinations of columns in the source, to columns in the data target. Convert the extract data into the form necessary for the data target. 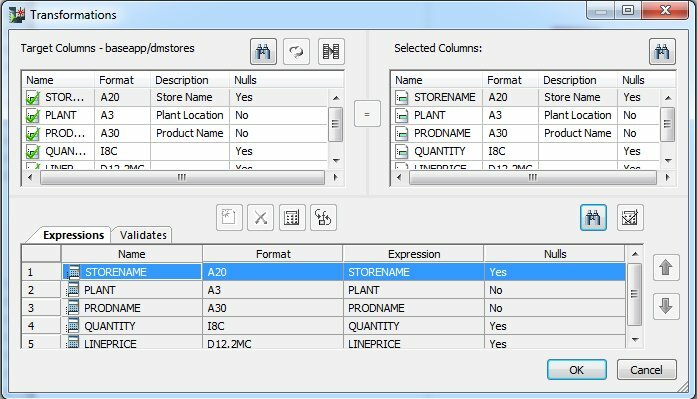 Create a temporary column for mapping. Note: You can create a temporary column within the mapping step to add intermediate calculations that are not part of the original SQL command or target data. This is often useful for complex calculations that are actually composed of multiple expressions. Creating a temporary column makes the transformation easier to understand and support. It is also helpful in performing data type conversions when multiple steps are required. Automapping automatically maps columns with the same name. Simple mapping maps one column in the source to one in the target. Note: The target column format should be at least as large as the source column format, but you can adjust the transformation to accommodate different format sizes. While you can map to an existing flat file, there are some considerations that should be taken into account. Flat files do not have all of the options for loading data into the target that other data types do (for example, key matching logic). DataMigrator respects the data types described in the synonym of the flat file. For example, if the synonym describes numeric columns in integer format, data will be written to the file in that format. 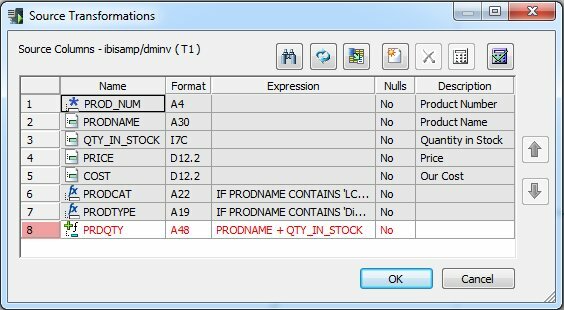 If a file already exists with the specified name, DataMigrator will append data to that file, unless you select the Prior to Load option of Delete File. Existing data in a flat file cannot be updated. On the Flow tab, in the Tools group, click Options. Select Data Flow Designer from the User Preferences tree. Select the Automatically map all columns check box in the Add Target section. From the data flow workspace, double-click a target, or right-click it and select Target Transformations. The Transformations window opens, as shown in the following image. To map columns with identical names, click the AutoMap button. The mapping will appear in the grid under the Expressions tab. To map columns with different names, select one column from each grid and click the equal sign. The mapping will appear in the grid under the Expressions tab, with the Selected Column appearing in the Transform Expression box. To create a complex mapping for a target column, double-click a column to move it to the Expressions tab. Click the Edit transforms button. Create an expression using the Columns/Variables and Functions tabs, and the calculator buttons. For details on using the Transformation Calculator, see Transformation Calculator. For information about using functions, see Using Functions. For information about using variables, see Using Variables in a Flow. The new mapping will appear in the grid under the Expressions tab. Note: The transformations will occur in the order in which they appear in the Expressions tab. If you need to change the order, select a transformation and use the up and down arrows. In the data flow workspace, double-click a target, or right-click it and select Target Transformations. Click the Insert Transforms button. Type a name and type or select a format for the column. Create an expression using the Columns/Variables and Functions tabs and the calculator buttons. For details on using the Transformation Calculator, see Transformation Calculator. For information about using functions, see Using Functions. For information about using variables, see Using Variables in a Flow. The new mapping is now available as a column in the Transformation Calculator, and can be used to create a complex expression. Tip: Since calculations are performed in the order they appear, make sure that your temporary column appears before any column in the Transform Rules box that uses it to calculate a value. The DB_LOOKUP function allows you to build data flows that perform lookups into multiple tables using target transformations instead of explicit joins. This approach can simplify flows that require lookup values from numerous tables. For information about using the DB_LOOKUP function to create source transformations, see Using Lookups to Create Multi-Table Flows Without Joins. From the data flow workspace, double-click a target object, or right-click it and select Target Transformations. Double-click the column that will use the lookup. The column is moved to the grid under the Expressions tab. With the column selected in the Expression grid, click the Edit transforms button. Click the Functions tab, expand the Data Source and Decoding folder, and double-click the DB_LOOKUP function. The prototype for DB_LOOKUP appears in the Expression window and the DB_LOOKUP dialog box opens. Select a synonym to use for the lookup by clicking the ellipsis (...) after the Lookup Synonym field. Select a synonym and click Select. From the Lookup window, click the Add/Delete button. A lookup is similar to a join in that it uses columns from two different tables. Select a column from the Source and Lookup Fields lists, and click the equal sign (=). Note: If you have Automatically add join conditions checked in the Data Management section of the Options dialog box, the Lookup is added automatically, since both data sources have a column with the same name and format, and that column is a key column in the lookup table. Select the value to return from the lookup from the Return Field drop-down menu. Select the original column name and click OK. Note that in this case, the format of the column is A20. The expression is completed in the Transformation Calculator window. The Transformation Calculator should now look like this. The target transformation is added to the Transformations window. Click OK to close the Transformations window. Type a name or select a format for the virtual column. Double-click the variable you want assigned to the column from the DM or System Variables folder in the Columns/Variables tab. You can also type in the variable, which must be enclosed in single quotation marks (‘). The variable appears in the Expression column in the Transformations window. Double-click the column number or name in the Expressions tab. Select the column name in the Expressions tab and click the Edit transforms button. Note: You can use the Function Assist button to change the parameters of a transformation that uses the DB_LOOKUP function. When you are finished with your changes click OK.
You can also double-click the Expression field in the Expressions tab, and enter the expression directly. If the format of the target column is smaller than the format of the source column, the transformation mapping will fail. For example, moving a column formatted as A24 into a column formatted as A10 will fail because you cannot move 24 characters into a 10-character field. To solve this problem, you would need to use edit or substring in a transform expression. The Transformations window provides an option for automatically adjusting the transformation to reconcile different format sizes. Adjust will also convert integer, alphanumeric, and datetime source columns so that they match the target column. Map the source and target columns by selecting one from each list and clicking the equal sign. The mapping appears in the Expressions list. With the expression highlighted, click the Adjust Expression button. The Transform Expression now shows the use of substring to move the correct number of characters into the target field. For example, only as many characters as will fit in the target column will be moved. Right-click the title bar under the Expression tab in the Transformations window. Select Customize from the context menu and then select Description. The Transformations window opens and now shows a Description column. Here you can enter a comment for the transformation that is stored in the flow, as shown in the following image. Click the Test Transformation button. The Test Transformation window opens with sample data for the transformations. To access the Transformations dialog box from the data flow workspace, double-click a target, or right-click a target and select Target Transformations. Refreshes the columns in the target. Maps all columns with identical names. Lists the columns in the data target. Lists the columns in the data source. 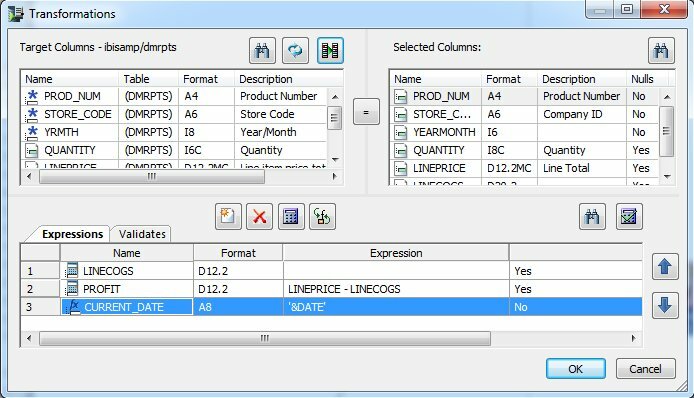 Next to each column name, there is a symbol that indicates regular columns, key columns, index columns, and virtual columns. Virtual columns (in Target columns only). These are grayed and cannot be selected for mapping. Establishes the relationship between the selected columns as equal. Inserts a new mapping and opens the Transformation Calculator. Opens the Transformation Calculator to edit the selected mapping. Adjusts the transformation expression to reconcile different format sizes. Lists the transformation mappings. To access the context menu with available options for the transformations, right-click a transformation in this tab. For more information, see Source Transformations Context Menu. Lists transformations that screen records as they are loaded into the data target. If a record does not meet the criteria, it is rejected. Retrieves, by default, 50 records and 4096 characters per row from the source, and applies all available transformations. This option enables you to review the data being moved and to ensure that the syntax of each transformation is correct. No duplicate processing is performed. For example, if a key value is duplicated, a unique constraint violation may occur. Similarly, if a value is missing for a column described as not null, a constraint violation will occur at run time. Note: You can set the number of rows retrieved from the Options dialog box under the Run Options branch of the User Preferences tree. The default is 50 rows. If there are any errors, the Server Messages window displays an error message and marks the incorrect transformation in red. Move the selected mapping to change the order of the transformations. In the Transformations window, right-click the header line for the transformations and select Customize. In the list of column names, select Description. A Description column now appears. You can enter descriptions for any transformation and they are saved as part of the flow. 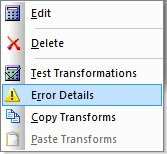 Error details for transformations can be viewed in the DMC. If an error is made, the transform will appear in red, as shown in the following image. Right-click the error and select Error Details, as seen in the following image. The Error(s) Details window opens, as seen in the following image. To see the error message details, click the error message number. A window opens explaining the error, as seen in the following image. Note: This method of viewing error details also applies to target transformations. You can create a business rule that screens records as they are loaded into the data target. If a record does not meet the criteria, it is rejected. If a value meets the criteria of the rule, a value of 1 is assigned to the record and the record is loaded. If the value does not meet the criteria of the record, the value of 0 is assigned to the record and the record is rejected. In the Transformations window, select the Validates tab. The Transformation Calculator opens with a name and format already provided. Optionally, enter a name for the validation rule in the Column field. Create an expression for the validation rule using the Columns, Functions, and Variables tabs, and the calculator buttons. If the expression evaluates to TRUE then the row is loaded in the target table. If the expression evaluates to FALSE then the row is rejected as invalid. Note that the validation is performed after any filters or aggregation. For example, if you enter QUANTITY GT 10, only records where the sum of the values of QUANTITY for the group by fields is greater than 10 will be loaded. The count of rejected rows is reported in the DataMigrator log as invalid records. These records can also be logged to a file for review. For more information, see Transformation Calculator. The validation rule appears in the grid below the Validates tab.